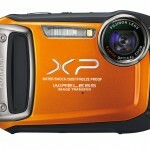 Add another waterproof outdoor camera to the many options available for summer 2012! 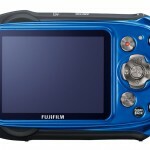 Fujifilm has added wireless image transfer to the FinePix XP waterproof point-and-shoots – their bestselling line of cameras. The new 14-megapixel Fujifilm FinePix XP170 lets photographers wirelessly transfer photos and videos from the camera to an iPhone, iPad or Android mobile device with a free Fujifilm app. Like Fujifilm’s other XP cameras, the XP170 has “Four-Way Protection.” It’s waterproof to 33 feet (10M), it can handle drops up to 6.5 feet (2M) (Shockproof), it’s freezeproof to 14°F (-10°C) and the waterproof seals also make it dustproof. 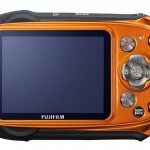 Fujifilm says it’s got quicker startup and shot-to-shot times than previous XP cameras and it can even shoot 10 frames per second – great for outdoor action photos! The XP170 has a 5x 28-140mm (equivalent) optical zoom with a protective glass cover that has a water repellent coating so you won’t get blurry water drop blobs in your water park photos. 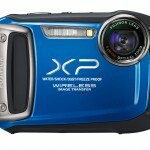 The Fujifilm FinePix XP170 will be available from stores and online dealers next month (June, 2012) at a suggested retail price of US $279.95. It will come in blue or orange and there will also be an optional accessory kit that includes a floating camera strap, protective silicone skin and neoprene case.